With the Assos equipeSocks_evo7 you'll have one pair of socks to rule them all. Whether you've got a busy preseason, or you're stringing together multiple disciplines into one neverending season, the lightweight blended construction of these socks will ensure you're always prepared. Blending nylon, elastene and polypropylene into one complex weave, the equipeSocks wick moisture away from the skin and out into the air through its hydrophobic fibers, ensuring moisture is spread across the sock instead of settling in one difficult-to-reach area. The lightweight, breezy structure virtually disappears once on your foot, yet still supports the key areas of the toe box, arch, and heel of the foot. 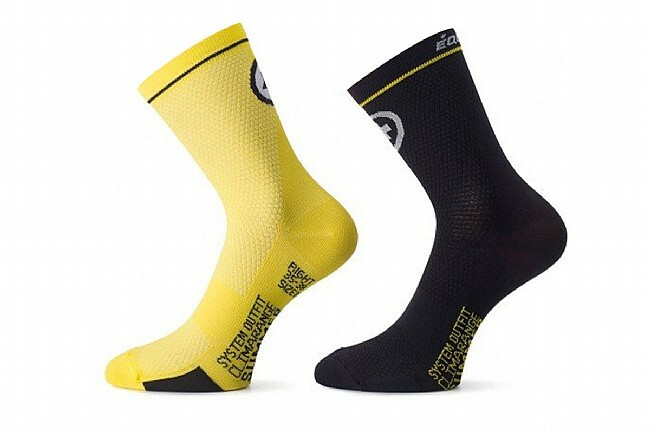 The Assos equipeSocks_evo7 are two different colors: Holy White and Black, Volt Yellow and Black, and National Red and Black.